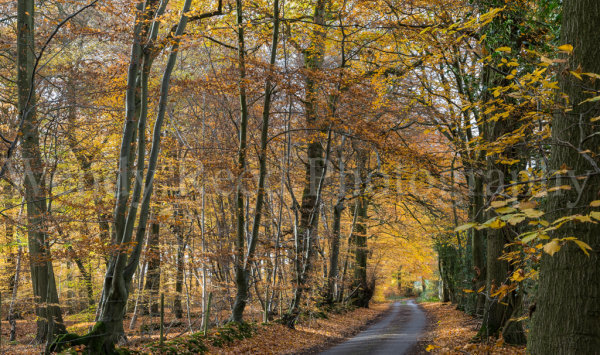 The final stages of Autumn, when the leaves have turned to orange and caramel is the best time in the beech woods. This Autumn the colours seem particularly vibrant and I have spent a lot of time in two of my favourite woods close to Stoke Row. From a few abortive attempts to take photographs in the woods I have found that late morning to lunch time is the best time when the sun is high enough in the sky to light up the tops of the trees as well as lower down. I have also found that although I wouldn't choose to include a road in a photograph, the best colours are often at the edges of woods and thus near roads and a lane or road running into the distance does invite the viewer to walk into the photograph. This photograph was taken in Rocky Lane, which runs from near Highmoor to meet the road to Henley. It is accessible to vehicles but fairly quiet. I had to wait a long time for the sun to make an appearance through light cloud, so patience was required but these were the conditions I wanted so the light wasn't too harsh. it was a lovely moment when the woods were lit up but fairly fleeting and soon all the leaves will be down and we will have to wait for next year to see it all again!